This time no blog written by me, but an article published in the National Geographic of April 2014. About what or who? About those special Breton women! Climbing out of a tiny European car is challenging enough; it’s nearly impossible in a hat 13 inches tall. Yet Alexia Caoudal, 87, and Marie-Louise Lopéré, 90, manage to cantilever out of the backseat of a friend’s silver Citroën with remarkable dignity, if not grace. Their host hurries to greet them with such smiling deference that they might be royalty. Princesses they are not—the two women spent decades toiling in fish canneries. But Caoudal and Lopéré have achieved a certain celebrity in this bit of northwest France known as Bigouden country, in the Finistère region at the western edge of Brittany. 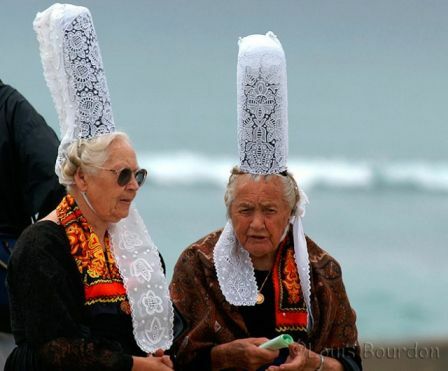 They are the only women known to routinely wear the towering headdress, or coiffe, that was once a part of daily life here. 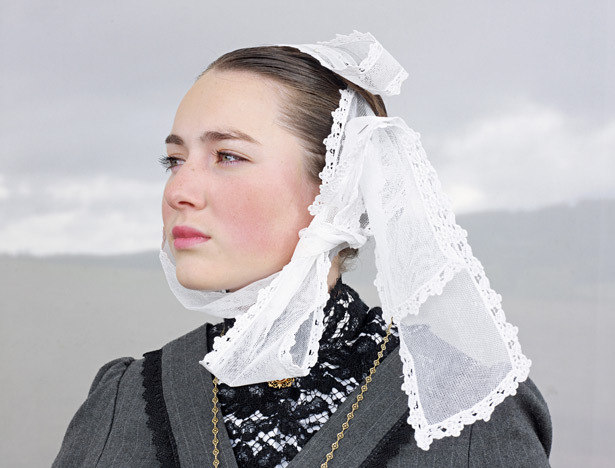 Age has bent their bodies, but the stiff lace stands tall atop their waves of white hair, like a lighthouse signaling: Here is a Bigouden woman. By the 1950s, however, most young women had abandoned the old style. Today it lives on in Breton rituals and in social groups called Celtic circles, where young people train year-round to compete in full costume at summer dance festivals. They also sometimes participate in weddings and a traditional religious pilgrimage, called apardon, during the feast of a local patron saint. Caoudal and Lopéré pull, comb, and pin their plaits up under a special black bonnet every morning, adding the lace top on Sundays and special occasions. Donning the full coiffe takes nearly half an hour and seems wildly impractical on this wet and windy edge of the North Atlantic. Is it comfortable? “We’re used to it,” says Caoudal, shrugging. Like others of their generation, the women speak a mixture of French and Breton, the regional language. Full of colliding consonants, it’s similar to Welsh, a reminder of Brittany’s Celtic heritage. A Bigouden woman is frank and unafraid, the girls in the circle say. She doesn’t let anyone walk all over her. Like her headdress, she is a tower of strength.